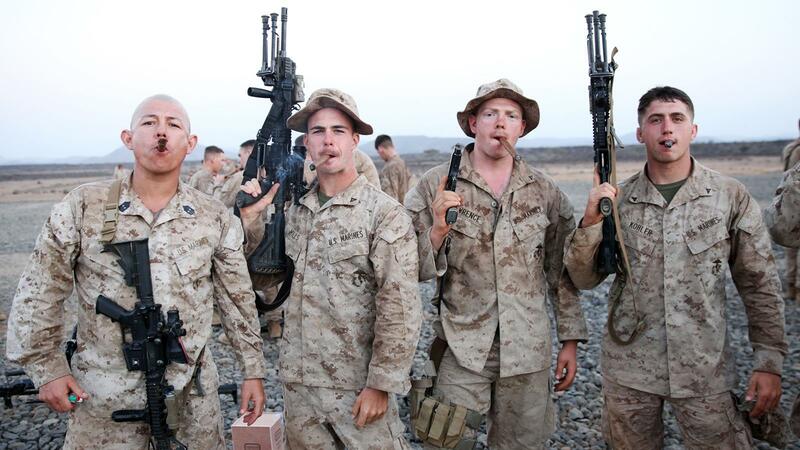 Marines enjoying cigars during an overseas training exercise. There are more than a few classic objects associated with the United States military. Jeeps. Ray-Ban Aviators. Ka-Bar knives. But arguably no item is so enjoyed or intrinsically linked to American troops as a cigar. From commanding Gen. Ulysses S. Grant chewing his cigar before the Battle of Shiloh to Gen. George S. Patton Jr. casually filling his personal humidor, the U.S. military has a deep-rooted history with this handmade symbol of success. Today, the age-old traditions of smoking a perfect cigar are melding with a less traditional partner: social media. And with an estimated 14 million service members in the United States Air Force, Army, Coast Guard, Marine Corps and Navy, two organizations are sending thousands of cigars annually to boost morale and show support. Operation Deployed and Cigars for Warriors each take a different approach, but aim for the same end: providing cigars for American military who are a long way from home. Robert Barr's family military history includes a staff sergeant, a submarine chief electrician, a navy pilot and ancestors who fought on both sides of the Civil War. It's no surprise that Barr, 62, finds himself communicating almost daily with military personnel; not about military tactics, but about cigar shipments from his military carepackage program, Operation Deployed. In 2013, Barr started the initiative (then known as Operation Cigar Drop) with the help of four-star Marine Corps Gen. Joseph Dunford Jr., who was handing out cigars during his visits to bases in Afghanistan. Fast forward two years, and Barr has overseen the distribution of more than 3,000 cigars to base camps in Afghanistan and the Middle East, while Dunford is now the chairman of the Joint Chiefs of Staff. The two men still exchange emails every Sunday. What began simply as a list of cigars has grown considerably, and now includes golf clubs, smoked bratwursts, rib eye steaks and even six-foot Fraser fir Christmas trees during the holidays. "We send premium products, premium cigars," said Barr. "We don't send girl scout cookies." The cigars, usually Ashtons with occasional E.P. Carrillos, are often sourced from smoking lounge Casa de Montecristo in Countryside, Illinois, and shipped to base chaplains in boxes of 50 or 100 for the troops. Every six months, when a new deployment arrives, Barr makes it a priority to arrange a special welcome package that includes 100 cigars, dried beef strips, chocolate bars, torch lighters and the most recent issue of Cigar Aficionado magazine. In a recent email to Barr, a recipient base chaplain (who must remain anonymous) expressed gratitude: "We are in the middle of nowhere. It is so dry here and dusty. Everything here is brown...You are so much appreciated." Marines pose with cigars while enroute to a training exercise. Operation Deployed started small and hasn't grown much; the team of unpaid volunteers is about 25 people. And while Barr is planning to turn the movement into a larger 501(c) nonprofit with a military advisory board, he puts emphasis on maintaining direct communication, and plans to keep it that way. "I want to know who these gifts are going to," he said. "Every package that I send, I know the individual. I'm with them in their deployment, and most of these individuals I remain friends with when they're deployed back home." Storm Boen, a retired first sergeant, is an Army veteran of 18 years with a different approach to cigar distribution. In just three years, a charity project that started with six friends became Cigars for Warriors, a 170-volunteer certified nonprofit. In the organization's first year, Boen, 42, hoped to send 900 cigars. In the following 18 months, the fledgling group sent out 200,000 cigars to U.S. troops. Cigars for Warriors, which got its jumpstart at the International Premium Cigar & Pipe Retailers tradeshow in 2012, operates by request only. Any U.S. service member can make requests to receive a shipment of 30 to 50 cigars. More than 160 donation centers are stationed around the United States at cigar shops as event coordinators work with vendors to create sponsored charity events. Many premium cigar companies have also made major donations. Boen and his team carefully categorize the shipments, putting an emphasis on those who are serving in the most dire circumstances. Requests coming from combat zones are top priority, and the definition of "combat zone" isn't limited to U.S. government classification. As an example, the U.S. does not recognize Africa as a war zone, but Cigars for Warriors does. "Any man or woman who has to be quarantined for two weeks deserves a cigar," Boen said gruffly. Second priority goes to long-term deployments outside the continental U.S. and Navy "floats," intense training and shipping operations aboard carrier ships that can last as long as nine months. Members of the U.S. Coast Guard patrolling war zones, a demographic often overlooked in care-package programs, are also included. Serving in Iraq, Boen made it a point to take off his military rank badges before giving cigars to his men, as an indication that individual titles were not relevant to enjoying a smoke. "It was the biggest morale booster we had. For the next two to three hours they could say what they wanted, getting a lot of that burden off their shoulders." Boen values the impact of a photo. When troops request cigars, Cigars for Warriors asks only that the men (and women) join the organization's Facebook group and send a picture of themselves enjoying a smoke. Most are happy to oblige. "There's no such thing as a bad premium cigar." To become involved with Operation Deployed, email Barr at rbarropdeployed@gmail.com. To become involved with Cigars for Warriors, visit cigarsforwarriors.org and also visit their Facebook page. This article first appeared in the December 1, 2015 issue of Cigar Insider.